Leading Aircraftman Ashley Beck, 1325825, Royal Air Force Volunteer Reserve. Ashley Beck was born in Summer 1912, the youngest son of Arthur Beck, a miner, and Annie Ibbotson who married at Ossett Holy Trinity Church on the 7th July 1888. Arthur, born about 1864, and Annie, born 1868, were living with their four surviving children, including three working unmarried daughters, at 21, Intake Lane, Ossett in 1911. Ashley was born the following year when his mother was 45 years of age. Ashley’s father, Arthur was aged 49 years of age at the time of Ashley’s birth, but sadly died in 1923, when Ashley was only ten years old. His widowed mother, Annie, married William T. Fozzard in early 1926 in the Dewsbury area. She died in Spring 1933 when Ashley was barely 20 years of age. Ashley Beck married of Sarah Kathleen Deacon, of Brook Green, Hammersmith in the Summer of 1938, the marriage taking place in Hammersmith Registration District, London. It appears there were no children in the short time the couple were married. LAC Ashley Beck was killed at 17 OTU, RAF Warboys on the 13th January 1942, Whilst on sentry duty, he was accidently killed by a round of ammunition fired in the gun pit. Verdict - Accidental Death. During WW2, RAF Warboys was a Royal Air Force heavy bomber station, situated just outside the village of Warboys in Huntingdonshire (now Cambridgeshire). 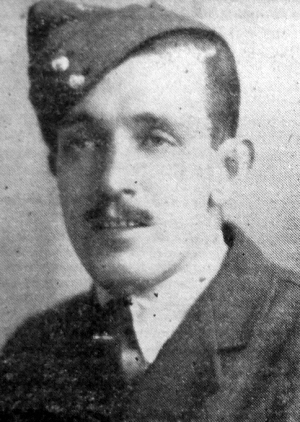 "Ossett Soldier's Death - Last week we announced the death of Leading-Aircraftman Ashley Beck (29), of the Royal Air Force, son of the late Mr. Arthur Beck and the late Mrs. Fozzard, of the Mason's Arms, Ossett. His tragic death being the result of an accident whilst on active service in this country. The funeral took place at Mortlake Cemetery, the mourners including the widow and members of her family in London, Guardsman Leslie Beck (brother), Mr. and Mrs. L. Greaves (brother-in-law and sister), Mrs. Flower, Ossett (sister), Mrs. J.W, Chapman, Ossett (sister). A Royal Air Force officer, sergeant and a number of the rank and file were present." 1. "Ossett Observer", Saturday, 31st January 1942.